Have you noticed? Plant cuisine is enjoying a huge moment of glory right now, and the health of people, animals, and our very planet are benefitting. It's a "trend" not likely to go away anytime soon - there are simply too many health benefits to enjoy when we swap out animal products for fresh plant foods. Here are just a few often noted by plant-based proponents: natural weight loss and/or maintenance, improved energy levels, fewer allergies, better digestion, improved skin health, more balanced hormones, and overall just feeling "better". Like all forms of cuisine, the key to making a plant-based dish ultra-enjoyable is making sure the flavors and textures are on point. And it's not as difficult as one might imagine. If we utilize fresh, whole, real ingredients, nature has already done the majority of the work, our job is to simply harness the goodness and combine things just right to create a synergy. And nothing adds more flavor like a good, thoughtfully formulated sauce. Sauces are key to making plant-based foods ‘pop’! Whether it’s a big raw salad, grilled, baked, or lightly steamed veggies, sauces and seasonings are key. This is where nut butter comes in, and why it is a true pantry essential on a plant-based path. Creamy, stone ground, raw nut butters make the perfect base for a variety of sauces and dressings that can be whipped together in a flash. 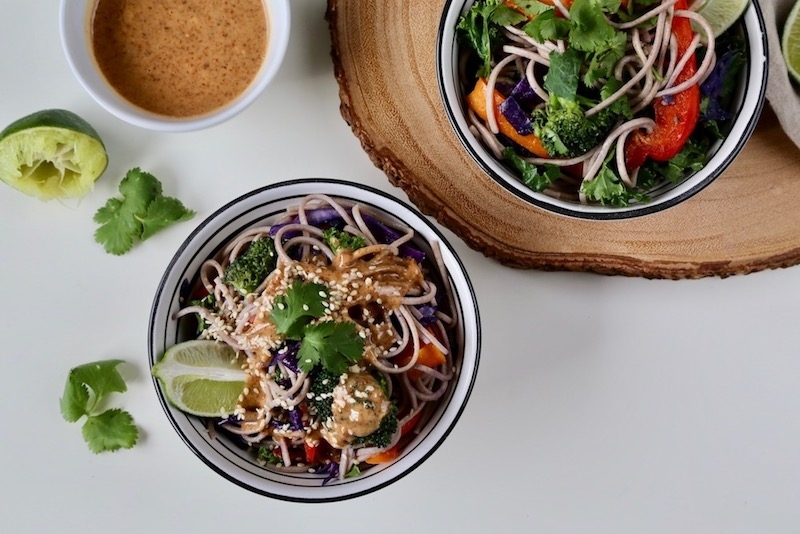 This recipe combines buckwheat soba noodles with fresh, lightly sautéed vegetables; delicious on their own, yes, but knock-your-socks-off-good when combined with the sauce. 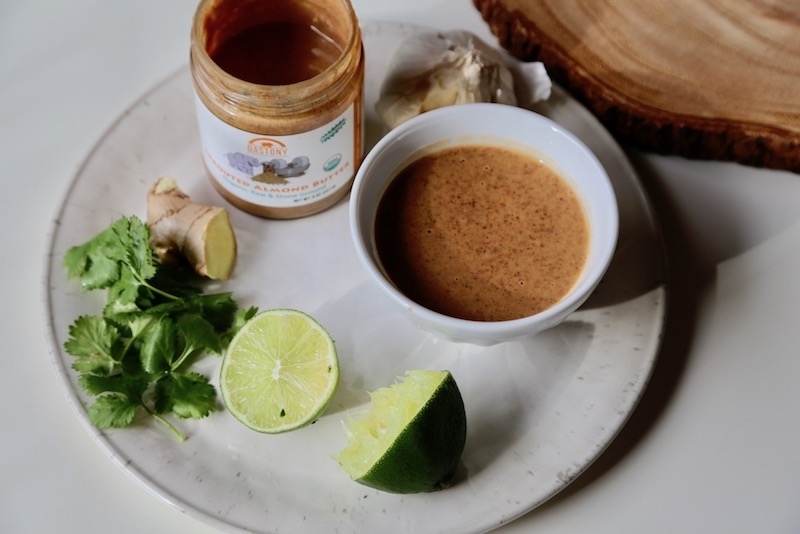 This Spicy-Sweet Chipotle Lime Sprouted Almond Sauce is creamy, rich, and chock full of the delicious Thai-inspired flavors of chili, lime, almond, sesame, and ginger. In terms of veggies, customize them to suit your own taste buds, what’s currently fresh and in season, or what you have in your fridge that needs to be used up. 1. Wash and peel butternut squash. Chop into bite-sized pieces and toss with several tsp of coconut or avocado oil. Roast squash for 45 minutes at 425F. 3. Prep veggies for sautéing by washing and slicing them up. 4. Heat 1 Tbs coconut oil in a large wok with minced ginger and garlic. Once the oil is hot, add prepped veggies and continue to sauté. Add a splash of coconut aminos, a dash of shoyu, and a drizzle of sesame oil. Continue to cook to sauté until desired texture is reached. 5. Once noodles are done, drain and flash rinse with cool water. 6. In a large bowl, combine cooked noodles with sautéed veggies. 7. Plate and drizzle with sauce (recipe is below!). Enjoy! 1. Mix ingredients in a blender, or whisk in a bowl using a fork, until well combined. NOTE: double the sauce recipe if you like your noodles extra saucy. Enjoy!